3! 3! 3! Memes in 1! 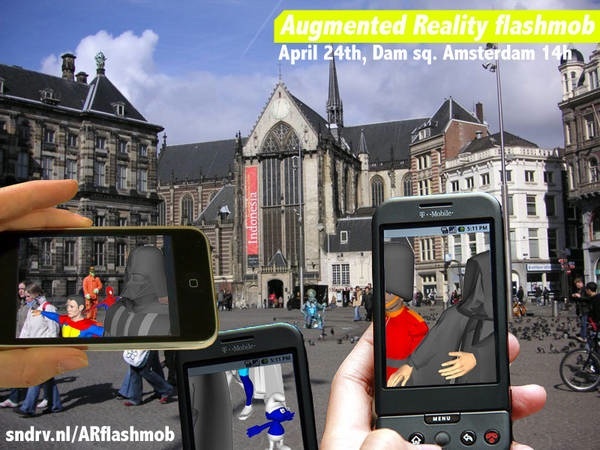 Amsterdam’s Augmented Reality-Flashmob-Human-Statue Art Jam! This weekend in Amsterdam you may see a whole bunch of people waving their smartphones around at once. It’s the first social net/augmented reality flashmob, aka a fabulous way to combine three novel Net memes into one event. The event’s happening at Dam Square at 14:00 local time on Saturday, and it’s been organized by Sander Veenhof, a self-professed “New Media artist,” with the assistance of TAB Worldmedia for the code that makes AR browser Layar serve up his artistic event. Veenhof’s motivations are simple, and fabulously geekish: “Every square in every major city in the world knows the ‘human statue’ phenomenon,” he notes, so the intention of this weekend’s performance art is to take the human statue game totally into the digital world. How will it work? First up, you’ve got to have a smartphone that’ll run Layar (i.e. one with GPS). You’ll have to load up Layar, if you haven’t already, and then look for the “ARflashmob” layer under the local tab–which presupposes you’re already in Amsterdam. Then you simply have to turn up at the venue, activate Layar, wave your smartphone in the air and ogle whatever strange and wonderful digital statue installations Veenhof’s chosen to populate the augmented space over Dam Square with. There’s a rumor that the Beatles will be showing up in pixel form, to recreate their famous Abbey Road pose. Is this the start of a new trend? You betcha. Flashmobs are still a popular affair, and AR is a tech that’s on the point of exploding into the mainstream public consciousness. Combine these two notions with a dab of performance art, and possibly even fling in some big gamer-spin off fun, and you’ve got a winner. I wonder how long it’ll be before a company like Vodafone, which has already experimented with organized flashmob PR stunts, jumps aboard and tries out this new trick? To keep up with this news follow me, Kit Eaton, on Twitter. That QR code on the left will take your smartphone to my Twitter feed too. And if you really liked this story, you can re-Tweet it too.